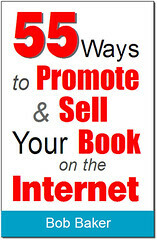 A great deal of your book's success depends on your ability to promote it yourself. Publishers are likely to be too busy to devote sufficient resources to your book's promotion. But help is at hand. If you've written a book, you can easily and inexpensively use e-mail and your web site to promote it. Here are 10 proven ways you can successfully promote your book on the Internet. Books tend to get "lost" when grafted onto existing web sites. For best results, create a web site specifically intended to promote and support your book. This permits you to focus all of the site's resources on promoting your book and leveraging off of its success. Choose a web site address based on your book's title, rather than your name. If you have done a good job of choosing your title, your title will be easier to remember than your name. You can easily cross-link your existing web site to your book's highly-focused web site. One of the best ways to promote your book is to allow readers to download a table of contents plus one or more sample chapters from your web site. Sample chapters "tease" readers into wanting more. To the extent that your sample chapter communicates competence and easy reading style, readers will be motivated to buy your book. Remember that uncertainty is the biggest obstacle you must overcome when making a sale to a stranger. In a bookstore, prospective buyers can thumb through your book. Online, readers can't do that, so they must depend on sample chapters. Use a desktop publishing software program to format your sample chapters for easy reading. Use Adobe Acrobat to create PDF files that will be sent to readers as e-mail attachments. When writing your book, include as many reasons as possible for readers to visit your web site. Success requires more than simply listing your web site address in your biography or on the last page of the book. Give readers valid reasons to visit your site. Offer downloadable versions of reader engagement tools like checklists and worksheets. Promise updated content and new information, such as ideas and topics that occurred to you after you completed your book. If your book is in black and white, but includes photographs or charts, post color versions of the visuals on your web site. Don't view your web site strictly as a promotional tool. Instead, view it as a "service" or resource intended to help readers make the most of your book. Use your web site to create an interactive relationship with your readers. Solicit their comments and questions. Offer a prize for the best question of the month and answer the question on your web site's home page. Respond to reader e-mail as quickly as possible. If their comments are critical, create a dialog and try to understand the criticism from your reader's point of view. You'll likely gain new information and ideas that you would otherwise never encounter. Whenever a reader writes a particularly favorable comment, immediately ask them for permission to use the comment with either their name, or their initials and their city. Many readers will welcome the opportunity to share their enthusiasm for your book with others. Most people like seeing their words and their names in print. Create a "press room" where members of the media can download files containing scanned images of you as well as the front cover of your book. Scanned images which can be immediately downloaded make your book more attractive to reviewers and other writers. Include a "backgrounder" describing you and your firm's background as well as your personal side. Include information that emphasizes the timeliness of your book and its importance to your readers. Provide answers to frequently asked questions. E-mail and your web site permit you to offer readers personalized assistance and opportunities for on-going relationships. These relationships represent win-win situations for both of you. Readers get access to your knowledge and expertise, while you get to develop additional sources of profit. Opportunities include telecoaching -- where you offer personal assistance based on weekly one-on-one telephone calls. You could also develop four, eight or 12-week training programs based on your book delivered via e-mail and weekly telephone calls. Each week, participants call a single number, called a "bridge," and discuss the reading and assignments which you sent out as e-mail attachments. A listserve permits participants in a telecourse to send e-mail to all other participants, exchanging ideas and promoting a sense of community. You can also use the web to serve your readers by developing e-books -- short electronic books that you sell directly from your web site. These can consist of in-depth treatment of specialized topics that are not appropriate for book-length treatment. Premium Content is limited-distribution, high-octane information that you send readers in exchange for providing their e-mail address and permission to contact them again in the future. Examples of premium content include articles that focus on particular problems that have been brought to your attention since your book appeared or in-depth treatment of topics too specialized to be included in your book. Premium content can also consist of your reflections on your book in the light of current economic and social trends. You can do your readers a favor, as well as maintain your awareness and pre-sell your next book, by publishing an e-mail newsletter. Make your e-mail newsletter as genuinely helpful as possible. Instead of a long, infrequently published newsletter, offer short nuggets of information that appear on a regular basis. Readers are busy and will respond favorably to concise, easily digested information. When soliciting reader e-mail addresses, always include your privacy statement, which should state that you will never rent, sell or share your readers' e-mail addresses. And make sure you live up to your promise! Give your e-mail recipients a reason to visit your book's web site. Don't just list its address, but provide an incentive for them to visit. Arouse their curiosity or offer them a valuable information premium they can download when they visit. This is especially true when you participate in online discussion groups or contribute a comment to an article that invites reader response. Roger C. Parker is the author of more than 38 books that have generated over $32 million in sales -- and have been translated into 37 languages. Visit his web site at www.PublishedAndProfitable.com. In this "insider's guide to self-publishing success," I reveal my best advice, including: 4 Ways to Attract More Readers (and Buyers) Faster, The 4 Myths That Hold Self-Publishers Back, The Best Way to Promote Your Book Right Now, and more. Copyright (c) 2007-2010 Bob Baker. All Rights Reserved. Site design template (c) 2007 Stylized. All rights reserved. Designed by NodeThirtyThree.